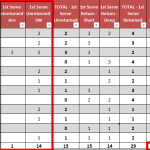 A detailed analysis of the return of serve performances of Novak Djokovic and Roger Federer during their semifinal at the 2013 Paris Masters 1000. 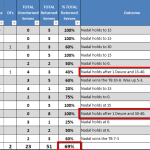 A detailed look into the return of serve performances of Novak Djokovic and Rafael Nadal in the Beijing final. The numbers tell an interesting story. 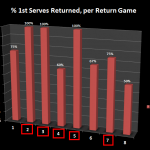 An in-depth look into the return of serve performance of Rafael Nadal and John Isner during the 2013 Cincinnati Final. 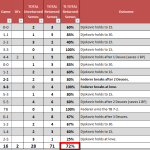 The numbers will surprise you. 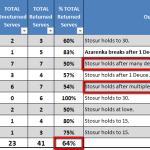 An examination of just how impressive Samantha Stosur was in the Carlsbad final, where she got her first ever win over Victoria Azarenka. 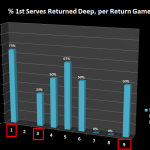 A detailed analysis of the return of serve performances of Victoria Azarenka and Ana Ivanovic during their Carlsbad semifinal. 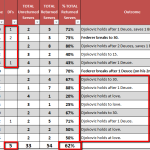 An in-depth analysis of the return of serve performances by Agnieszka Radwanska and Daniela Hantuchova during their Round of 16 match in Carlsbad. An in-depth look at how Rafael Nadal and Roger Federer returned serve during the 2013 Rome final. A detailed look into all of Rafael Nadal’s return games during his semifinal at the Rome Masters 1000 with Tomas Berdych.